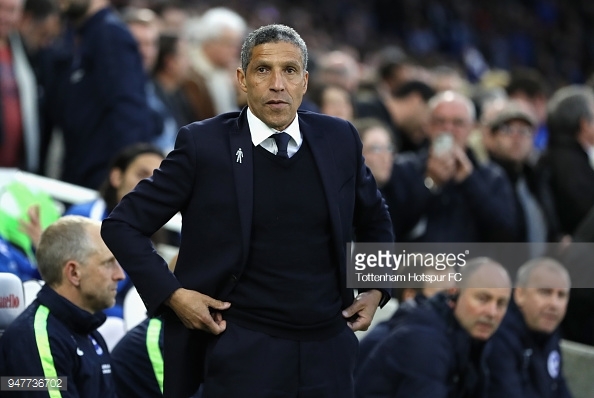 Chris Hughton on the sidelines at The Amex picture via Getty Images. Brighton & Hove Albion manager, Chris Hughton confirmed that it will be a quiet transfer window in terms of ingoings and outgoings regarding the senior squad. Hughton had the following to say on the January transfer window for him and Brighton: "At this moment our thoughts approaching this one was we didn't need to do any business and any business we would have done would have be due to circumstances, anybody coming available we didn't think would or an injury or so, but a very quiet one." However, there may have been a lot of ins and outs in terms of under 23 players with 12 players going out on loan or returning from loans and there may be a further two youth players coming on deadline day: "Well I think certainly until anything is confirmed it's correct not to say anything. "One thing I will say in this window was always our thoughts coming into this window, we didn't think we do anything on a senior level. "But we have an academy that is growing and the thought of the prospect of bringing in some young players as in that 23 group of players that we can develop, it's always been thought of ours, but until anything is confirmed I can not say anything." Hughton gave his reaction on Tuesday's defeat to Fulham: "It was a huge disappointment, but some aspects of our game were very good we played away from home scored two goals, we had another four or five possible good chances and I think as regards to our offensive play there was nothing wrong with that. "But I massively disappointed with the goals we conceded. At the time you don't want to give Fulham too much credit, but the way they changed the system and they caused us problems and we found it difficult to deal with, so credit has to be given to Fulham for the players they have got." Hughton was also asked his thoughts on Watford this season: " I think they are a very good side I saw them play last night up at Tottenham and they looked very good and the areas they came under pressure were the areas everyone comes under pressure against a Tottenham team at Wembley which is always difficult. "I thought they were always in the game, always a threat and they will be disappointed to concede the goals and the winning goal that they did. I think their league position says it." The Brighton boss also gave team news ahead of the game: "Well, of course, Alireza Jahanbakhsh is back from international duty and will train tomorrow. "Bernardo trained today and the decision to make on him is whether it is too soon to be included in the squad for Saturday, but it's good to have them back and it means that Jose Izquierdo is the only one out."